PhilBoxing.com has been officially credentialed to cover the ongoing 2012 NBA Finals. PhilBoxing NBA section editor Homer D. Sayson, will represent PhilBoxing.com's onsite coverage of pro basketball's greatest spectacle and will travel to Miami for the Eastern swing of the best-of-7 championship series. A veteran journalist with a shared passion for boxing and basketball, Sayson is a regular columnist of PhilBoxing.com. He earned his spurs at The Freeman Daily in Cebu City, where he used to be the assistant sports editor. Sayson penned a hugely popular column "Second Overtime" for SunStar Cebu from 2000 to 2007. Besides regularly covering the NBA, Sayson has also been credentialed to numerous world title fights involving Manny Pacquiao, Oscar De La Hoya, Mike Tyson, etc. This is Sayson's 9th NBA Finals accreditation in 12 years. 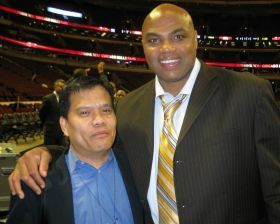 Photo: Homer Sayson (L) poses with former NBA star and now NBA panelist Charles Barkley.